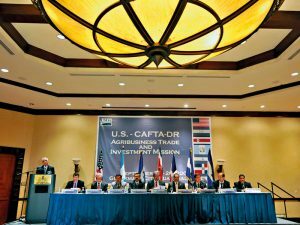 Representatives of five Central American countries – Nicaragua, Costa Rica, El Salvador, Honduras and Guatemala – met with counterparts from the US in 2001 to discuss the development of a trade relationship akin to the NAFTA agreement between the US, Mexico and Canada. The aim was to eliminate trade barriers between member countries, improving the US’ access to regional markets while encouraging economic growth in Central America through export diversification and higher foreign investment. Official negotiations began in January 2003, with the Dominican Republic joining in November. CAFTA, without the Dominican Republic, was signed on May 28, 2004. Separate negotiations between Central America and the Dominican Republic were undertaken to iron out issues stemming from a previous free trade arrangement between the two. The final CAFTA-DR agreement, which integrated the Dominican Republic, was signed in August 2004 in Washington DC. All seven signatories signed agreements to facilitate the handling of environmental measures within CAFTA-DR and establish the Environmental Affairs Council. CAFTA-DR came into force for El Salvador, Honduras, Nicaragua and Guatemala in 2006. 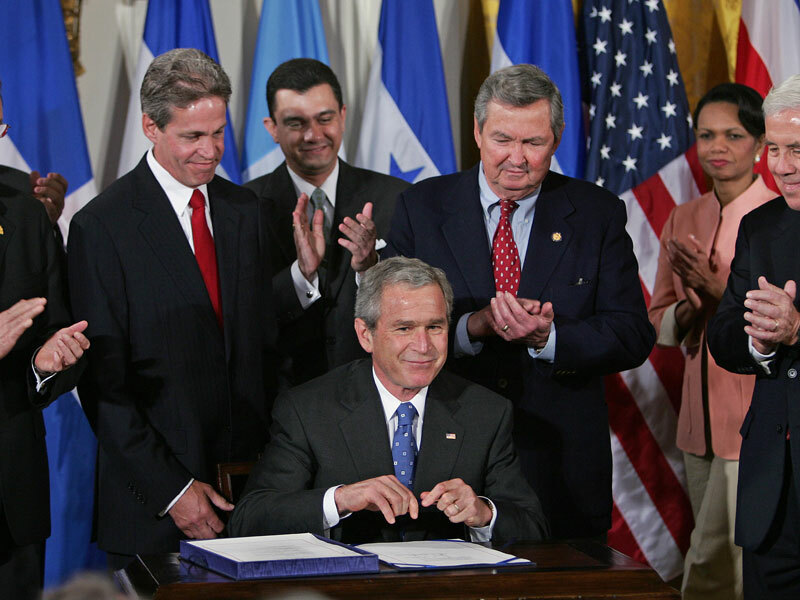 The Dominican Republic implemented the deal on March 1, 2007. Costa Rica held a referendum on whether to approve CAFTA-DR, in which Costa Ricans voted affirmatively, though by a narrow margin, on October 7, 2007 – it came into force two years later. Trade began to decline in November 2008, two months after the global financial crisis began. Two-way trade between the US and CAFTA-DR countries fell from $44.7bn in 2008 to $38.7bn in 2009. All Central American countries saw a sharp drop in foreign direct investment, which was exacerbated further by regional security issues. With the exception of Guatemala and the Dominican Republic, all CAFTA-DR countries saw negative economic growth in 2009. Bilateral trade between CAFTA-DR countries and the US returned to pre-crisis levels in 2010, with total trade amounting to $48.2bn. In March 2012, a number of Honduran and American labour organisations alleged that the Honduran Government was failing to enforce labour laws. At around the same time, the US requested the establishment of an arbitral panel to consider whether Guatemala was enforcing its labour laws pursuant to its commitments under CAFTA-DR. In April 2013, the US and Guatemala signed an enforcement plan to address the labour dispute that had prompted the establishment of the arbitral panel. Two-way trade between the US and the bloc saw its strongest year in 2014, totalling $59.6bn. US exports to the region alone amounted to $31.1bn, an increase of almost 85 percent from 2005, before the agreement had been signed. The CAFTA-DR bloc constituted the US’ 13th-largest export market and the third-largest in Latin America. As of 2015, $87.2m had been invested in the Environmental Cooperation programme, funding training in a number of environmental issues. Trade between the US and CAFTA-DR fell slightly but remained strong, totalling $52.4bn and $52bn in 2015 and 2016, respectively. US farm and food exports to CAFTA-DR countries doubled between 2006 and 2016. 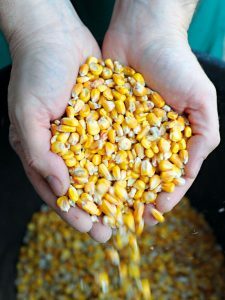 Corn exports from the US to the rest of the bloc were particularly strong, reaching record levels as tariff elimination schedules advanced. After scrutinising Guatemala’s labour law enforcement, the arbitral panel determined that the issues did not reflect a system-wide problem. The protectionist attitudes of the new US administration cast uncertainty over regional free trade agreements, particularly NAFTA. However, CAFTA-DR maintained consistent trade surpluses for the US, placing it on solid ground going forward. In 2017, the US saw its largest trade surplus with the bloc to date, amounting to over $7bn.